Most of my pot grown native plants were freed to live their lives in likely locations close to the house. A few of the rarer collections were maintained. 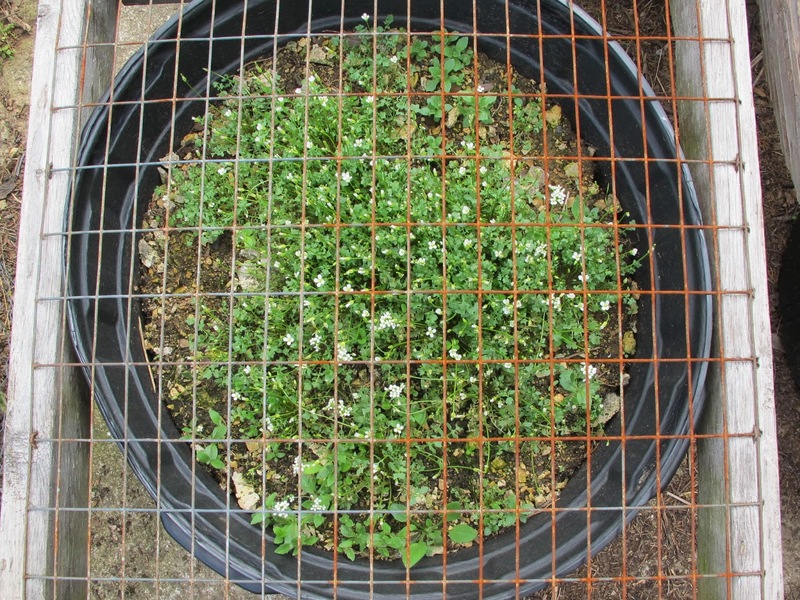 This container mimics gravelly barrens conditions and houses a mix of winter annuals found naturally in the poor, dry soils of the barrens. This plant community has successfully maintained itself for several years. Leavenworthia uniflora has always been the star performer and 2013 was no exception. The potted plants display a vigor far superior to that of the wild specimens. I’ve learned a lot about these plants by having them in a situation that allows daily viewing, but I would still like to create a situation that more closely matches that experienced by the wild plants. 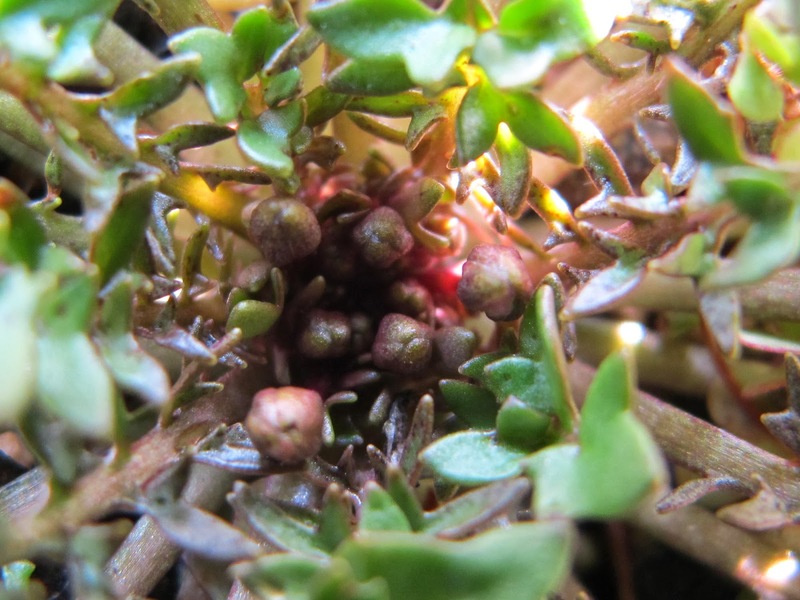 In March the Leavenworthia have created a tight cluster of flower buds in the center of the plant. Wild plants typically develop three or fewer buds. By April, a long stalk has pushed high above the leaves where a single four petalled flower blooms. 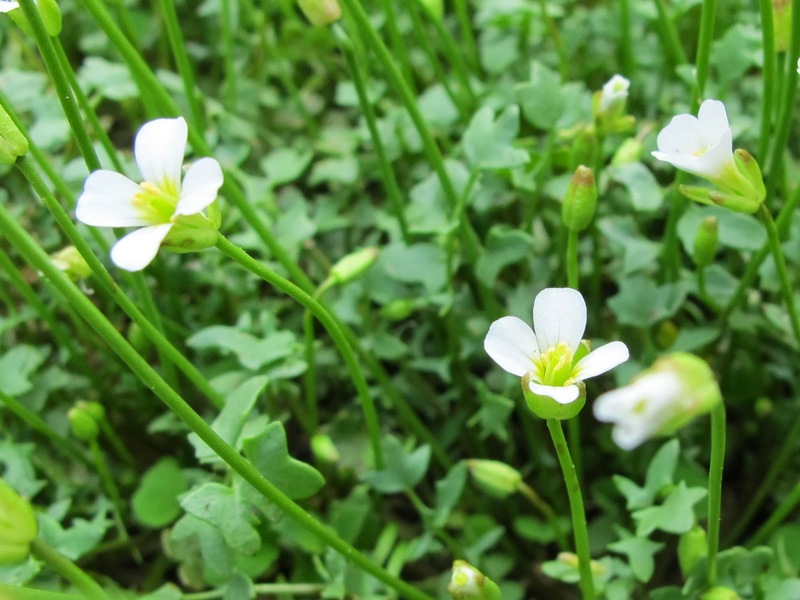 The flower is short lived and quickly gives way to a developing seed capsule. This forest of stalks produces enough seed to repopulate the pot as well as for me to collect a good quantity which I return to the site at which I originally obtained seed for this project. 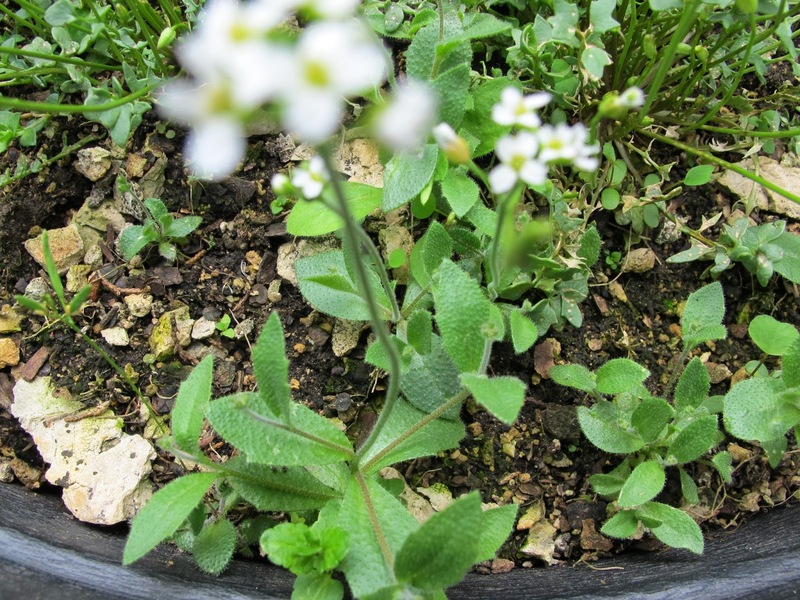 Also doing well in the pot is Draba cuneifolia. 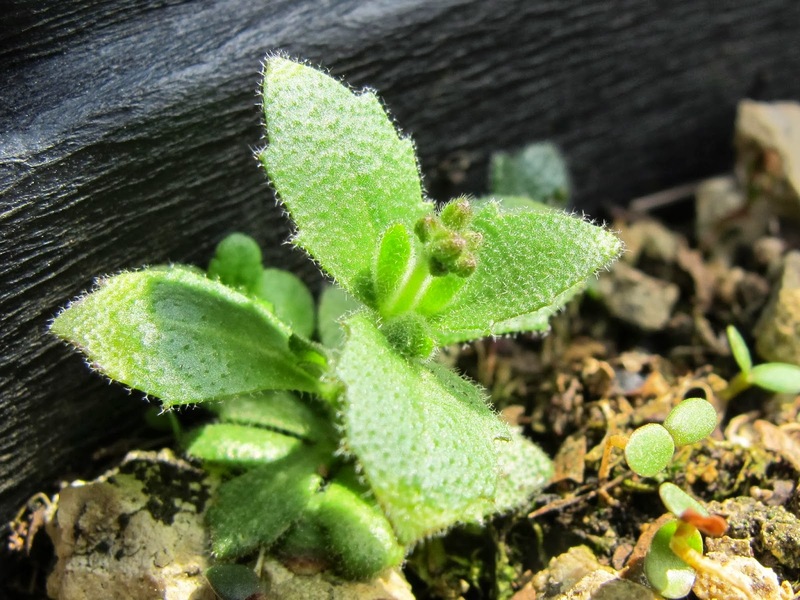 The Draba is typically a little behind the Leavenworthia in development. Buds are evident in early April. Flowers open a week later. Long stalks grow rapidly up through any competing vegetation so that the flowers are in the open and easily visited by small flies and bees. Draba cuneifolia normally begins growth in early fall and overwinters as a tiny, few leaved plant tucked in close to the soil. 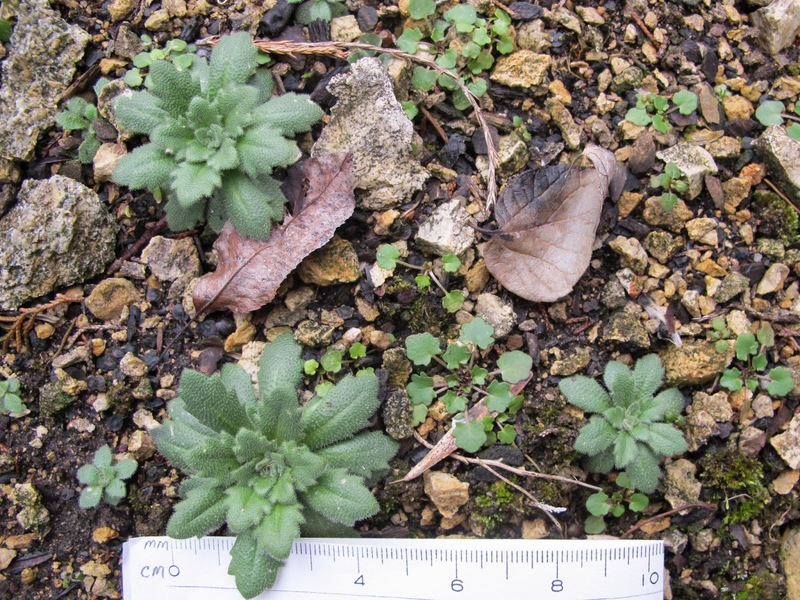 I was surprised in September 2013 when the Draba reached a growth stage equivalent to what is normally seen in early March. 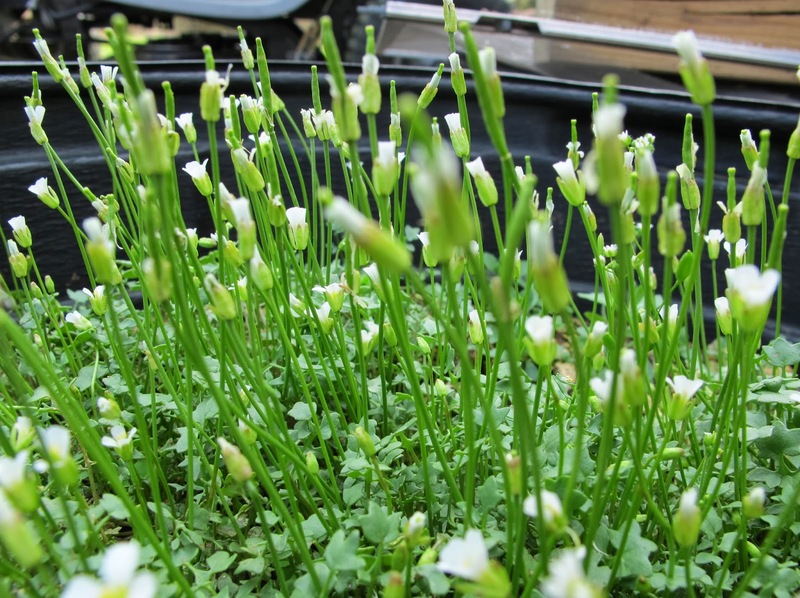 By mid-January, after enduring long periods of sub-zero temperatures and weeks of snow cover the developmentally advanced plants were doing wonderfully. These super plants were larger than any I had ever had in the pot. The plant up against the pot wall to the far right is the one shown in the previous photo. It has put on a lot of growth since September. I’m not claiming to have produced a race of giants. 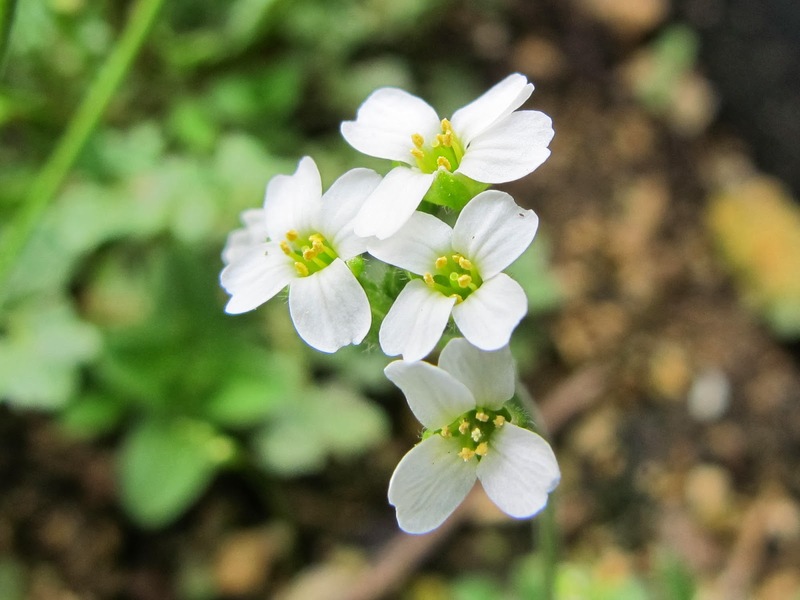 These individuals are well within the accepted size range for Draba cuneifolia. I’m just pointing out that the wild grown Blue Jay Barrens representatives of this species do not come close to expressing their full genetic potential. The wild plants remain small because that’s the best they can do under the conditions found in those areas in which they can survive. Improvement in growing conditions would probably favor competing vegetation, so instead of the Drabas growing larger, they would probably be crowded out. Here are the current conditions in the barrens pot. 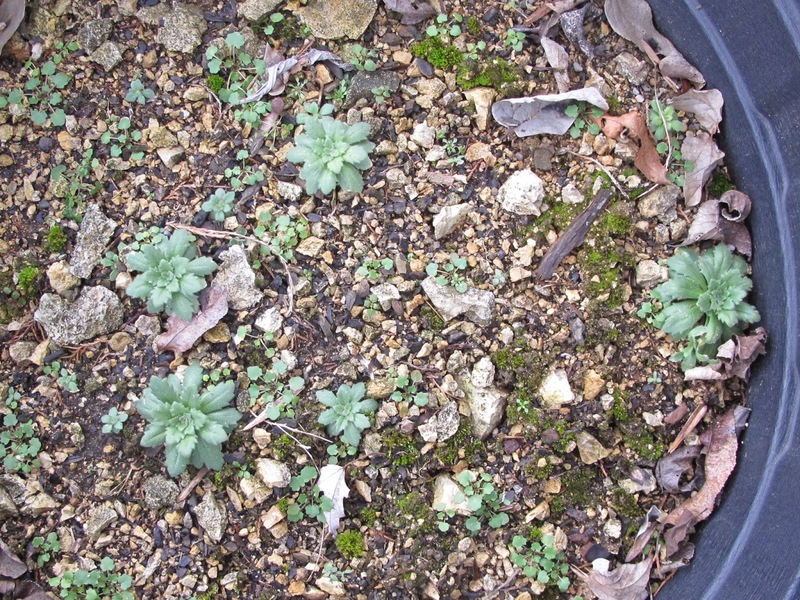 Draba cuneifolia is presently the most developed species in the mix. 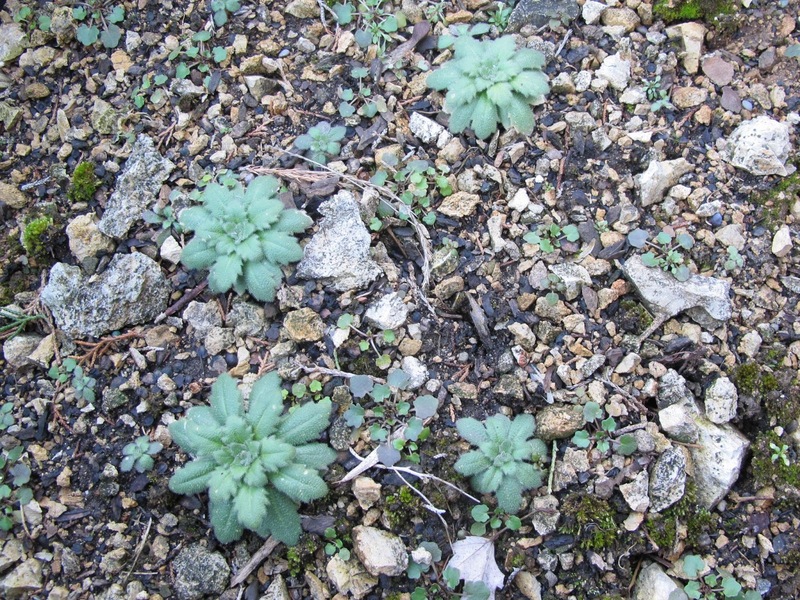 Leavenworthia uniflora is present in good numbers and there is a sprinkling of the diminutive Draba reptans. It’ll be interesting to see how things progress this spring. My bird feeding activity also attracts some non-bird visitors. 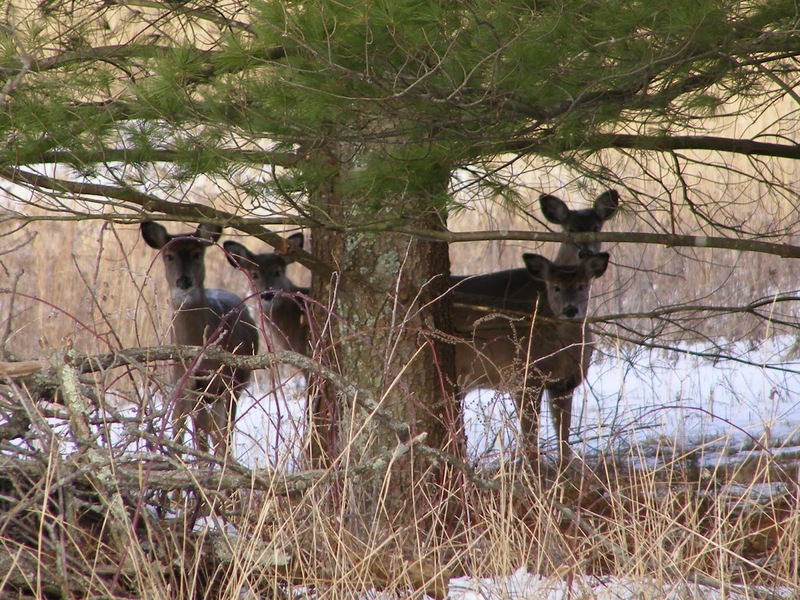 Most conspicuous are the Whitetail Deer. 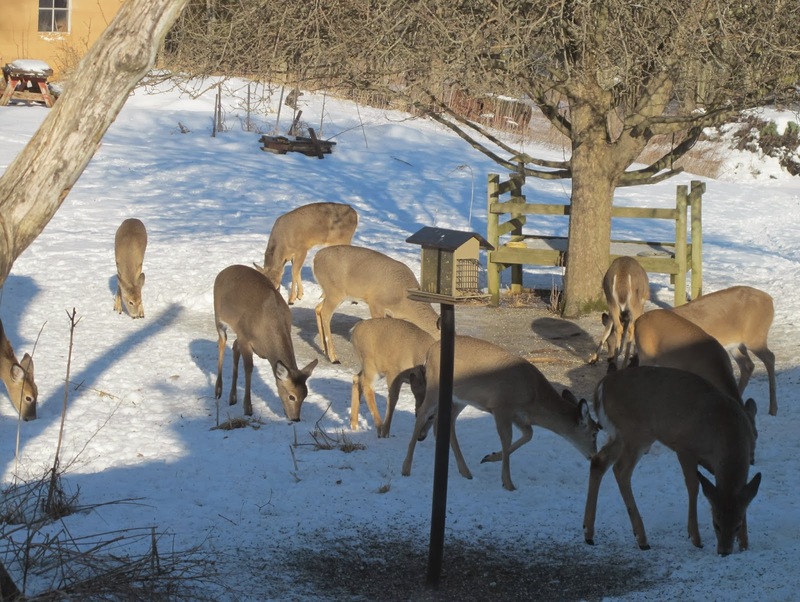 Deer visit the yard year-round, but their time spent around the feeders increases considerably when the ground is covered by snow and ice. When not in the yard searching for bits of corn, the deer are usually somewhere nearby in a position to observe my exit from the house. They associate my presence with the appearance of a corn treat. 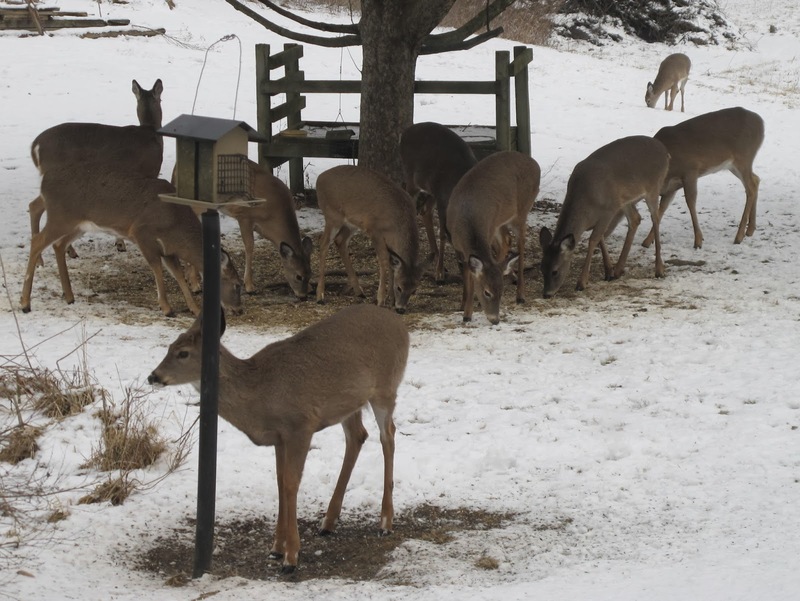 A feed bucket in my hand is an invitation for the deer to head for the yard. 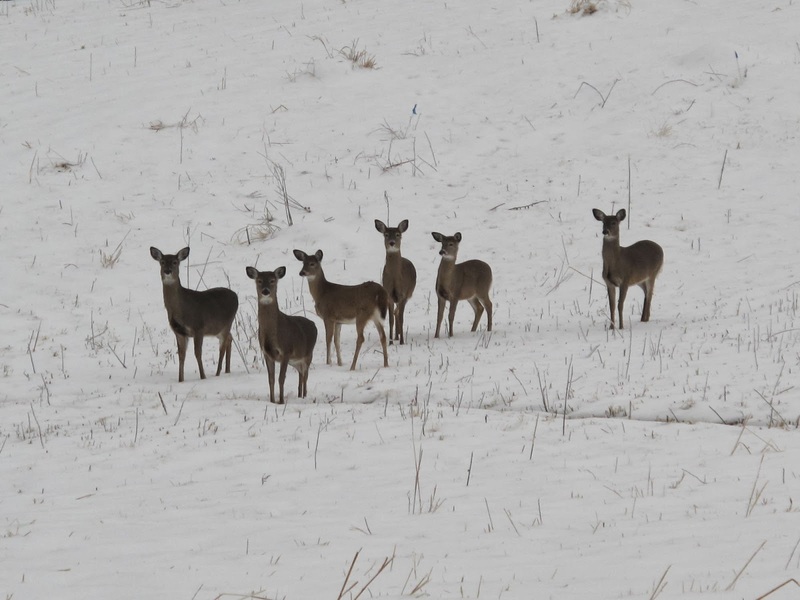 Most of these deer first visited the yard as fawns, led by their mothers who were searching for early apples. 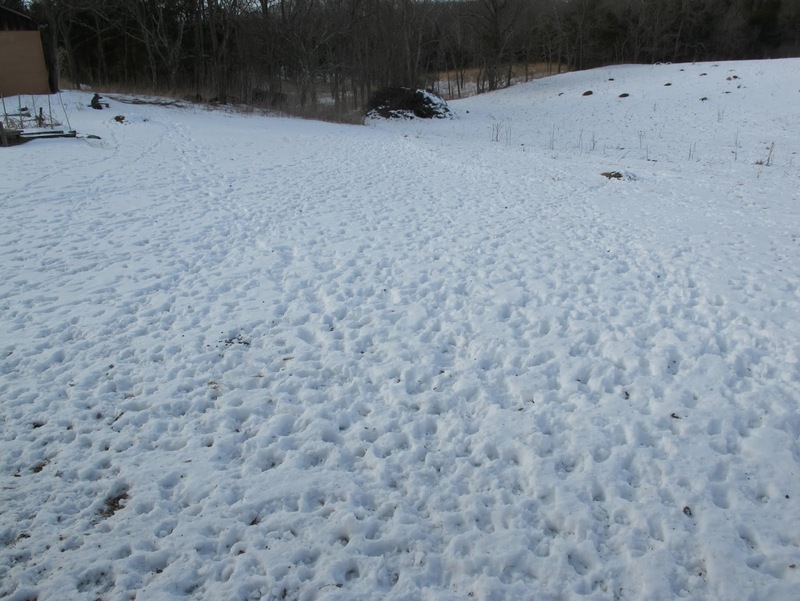 It doesn’t take any special skills to discover deer tracks around here. 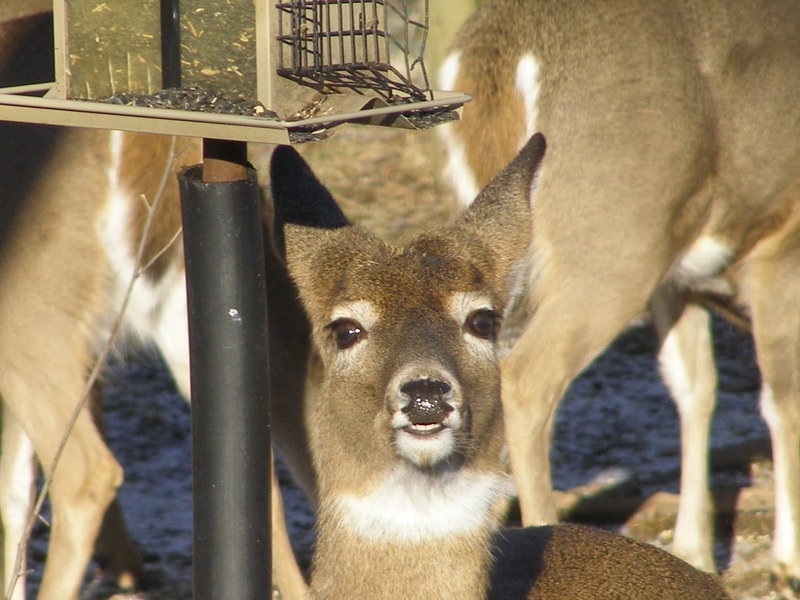 One young buck developed a taste for sunflower seeds and began waiting beneath the feeder for birds to drop a seed of two. He kept a close eye on the birds and collected the seeds as soon as they were pushed from the feeder. 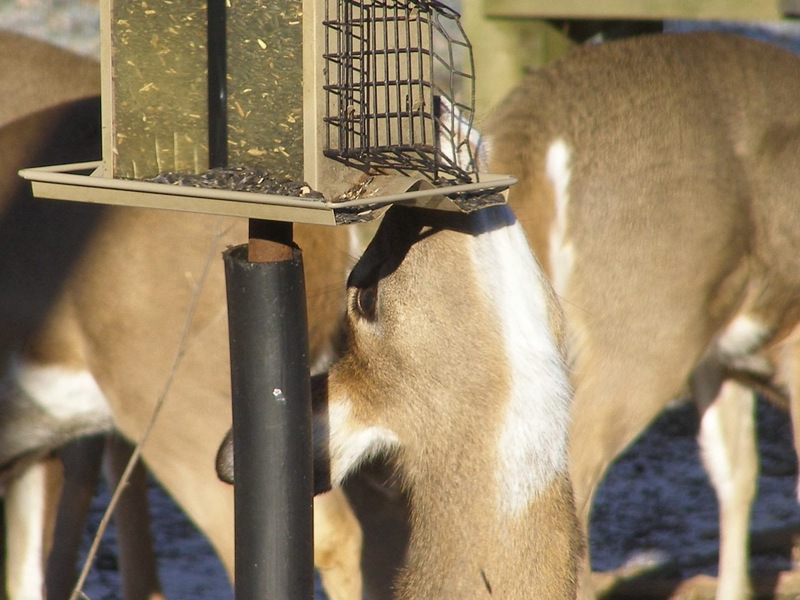 His next evolution in seed gathering involved scraping at the feeder pole with his paw. This maneuver was good for a few seeds, but it also tended to keep the birds away and resulted in a net decrease in seeds obtained. The scent of the seeds must have been strong. He would hold this attitude for 20 seconds at a time and then search the ground before once again looking upward. 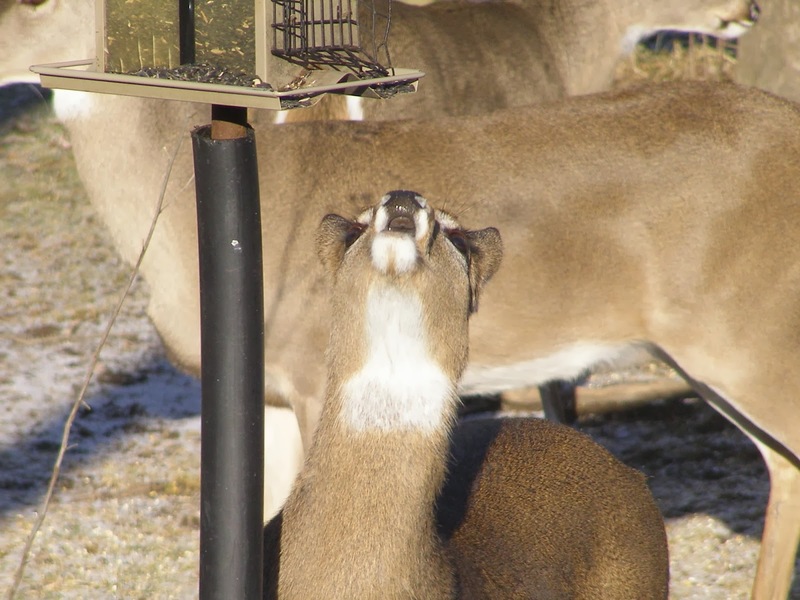 After a few false starts, he learned that he could get the seeds himself if he held his head beside the feeder and stuck his tongue out to the side. Judging by the rate at which seed was disappearing, he must have been filling his belly. He looks awfully pleased with himself. Shortly after this shot was taken, I built a collar around the base of the feeder that effectively blocks his attempts at obtaining more feed. I’m wondering how long it will take him to find a way around that. 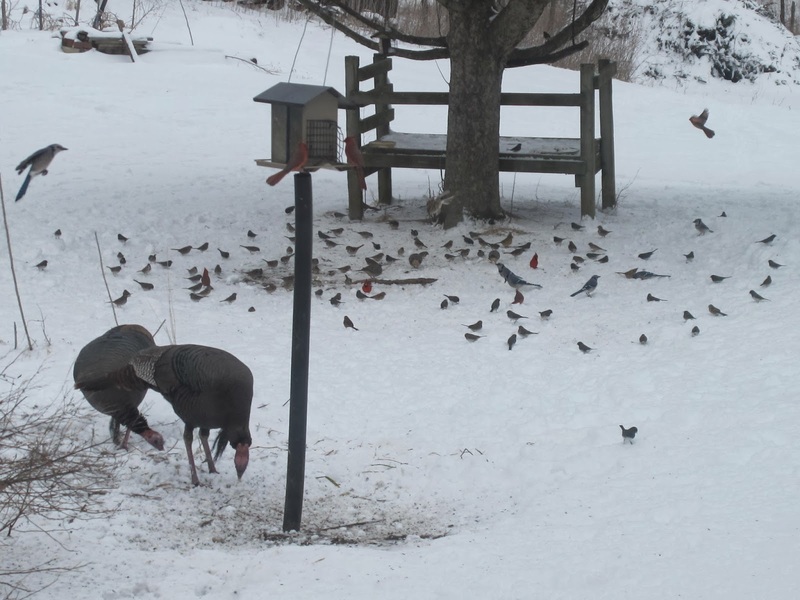 Activity at the bird feeder typically increases after a snow and this year has been no exception. Over three feet of snow has fallen at Blue Jay Barrens this season, making it difficult for birds to forage in their usual areas. 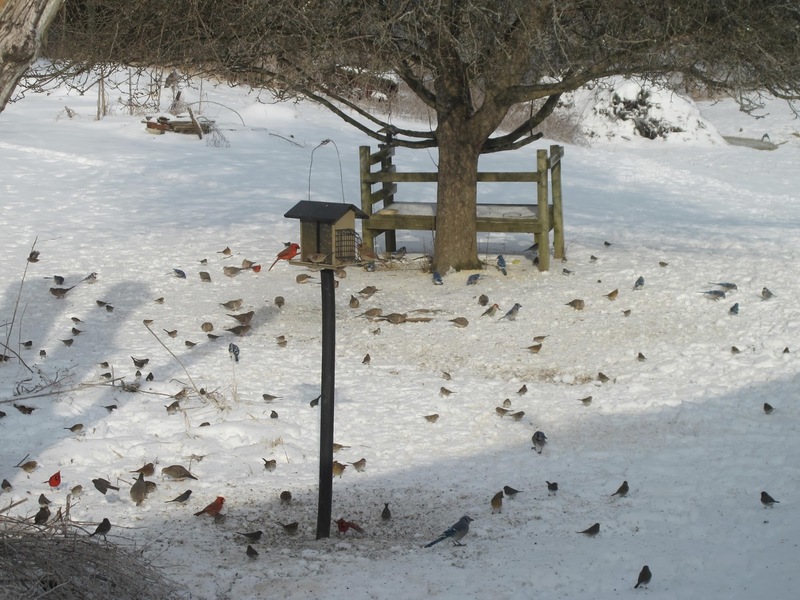 Each new snow seems to push a few more birds to the feeder. The bird feeding area is located just west of the house. I spread cracked corn on the ground beneath the overgrown apple tree to the right and feed sunflower seed from a pole mounted feeder. This area is left unmowed and generally develops a thick cover before frost kills off the top growth. 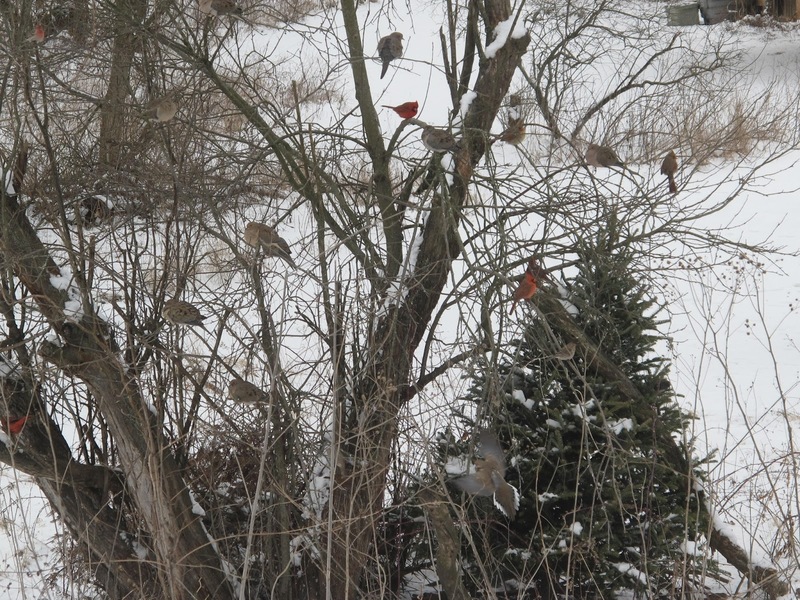 By this time of year, feeder visitors have knocked down all but the stoutest of vegetation. Cover produced by a half dead apple tree is enhanced by the addition of the annual Christmas tree. This year’s addition has been heavily used as a roost area by various sparrow species. Branches of the apple tree are a primary destination of birds flushed from their feeding area. 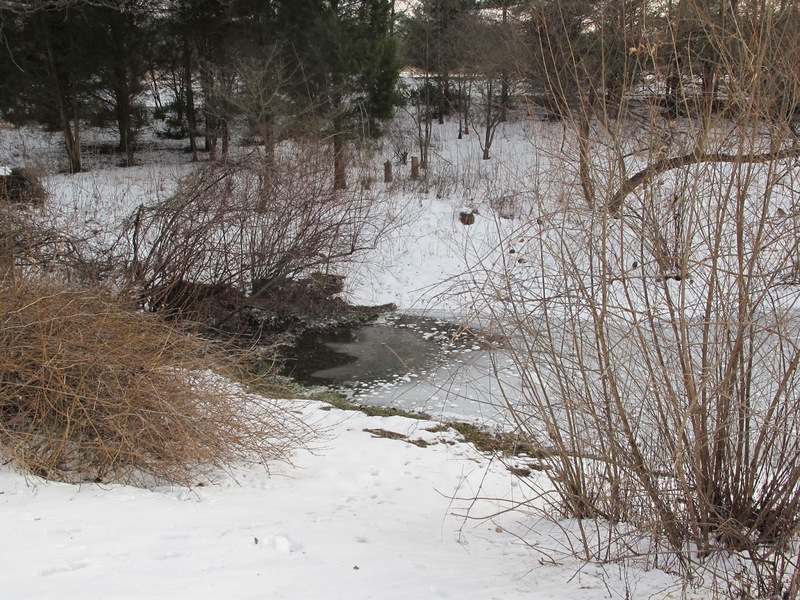 Despite below zero temperatures, open water is maintained by a seasonal spring feeding the pond in front of the house. This is often the only open water within a quarter mile. 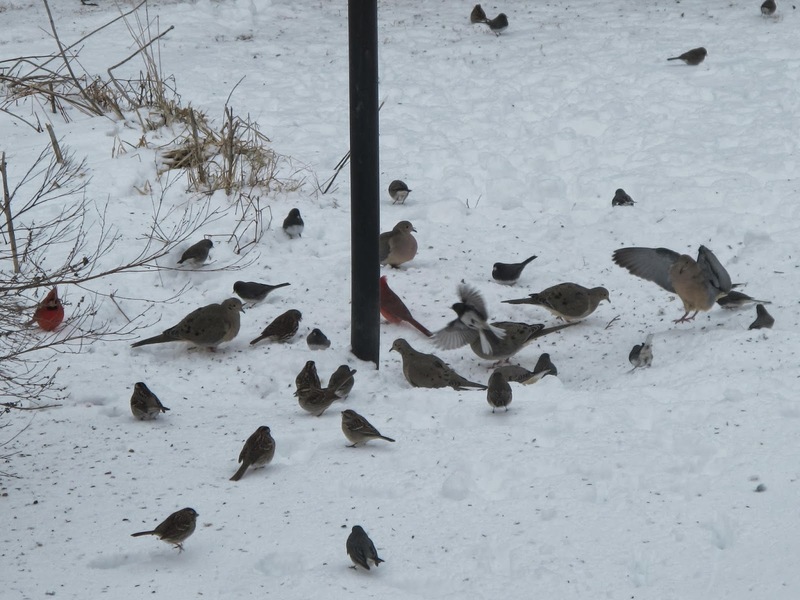 Bird activity at the feeder often reminds me of a crowd at a street fair. The birds are in constant motion. Some species seem to have preferred feeding times. Mourning Doves are generally most abundant early in the day. Cardinals are usually the last birds to retire from the feeder in the evening. This habit of late feeding makes them targets of Screech Owls. I have found several collections of owl pellets containing Cardinal bills, but I’ve never noticed any decline in the number of Cardinals. 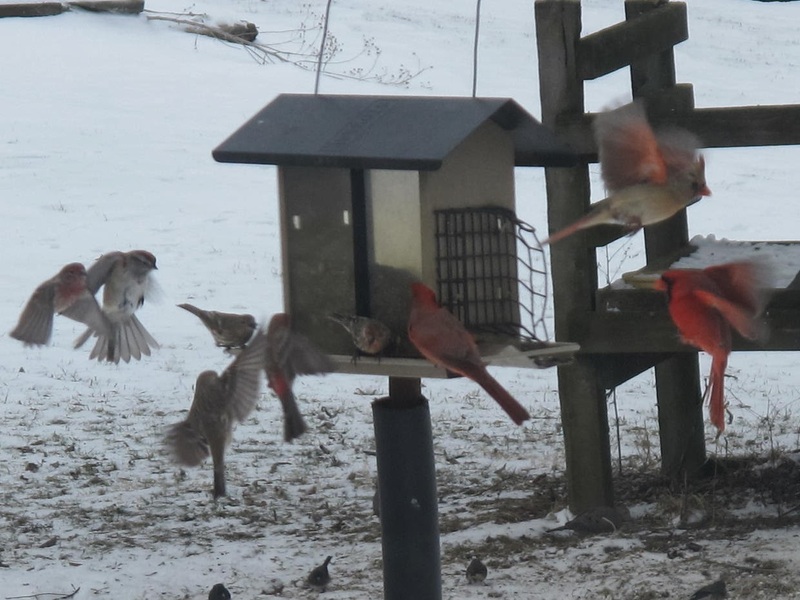 A crowd forms awaiting sunflower seeds that are knocked from the feeder. Feeder visitors are a mix of migrant and resident birds. The Blue Jay and Cardinal will nest nearby and bring their fledglings to the feeder this summer. 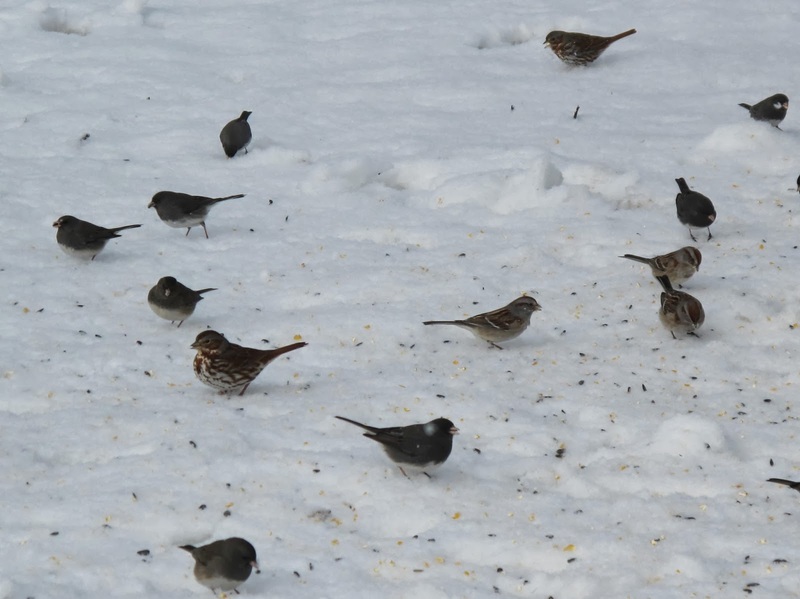 Juncos, Tree Sparrows and Fox Sparrows will disappear in the spring. 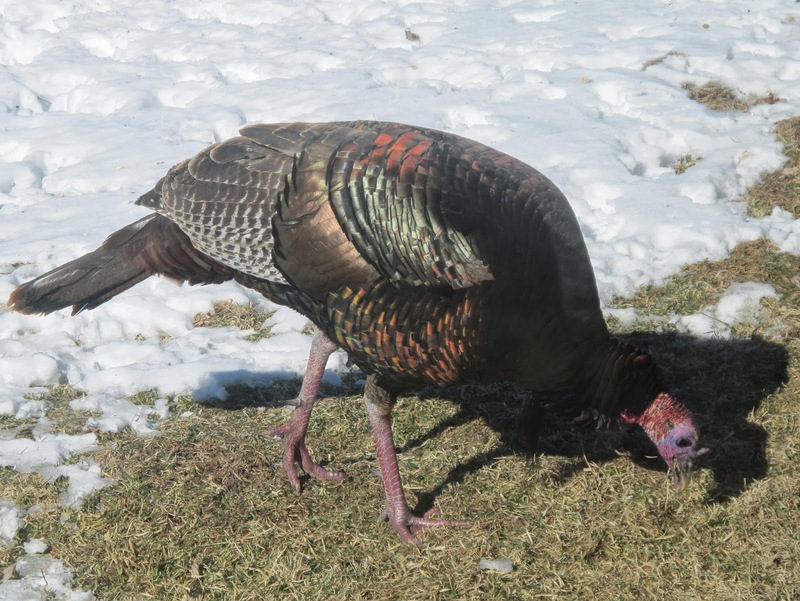 The local Wild Turkey population has been represented by a lone pair of Toms. 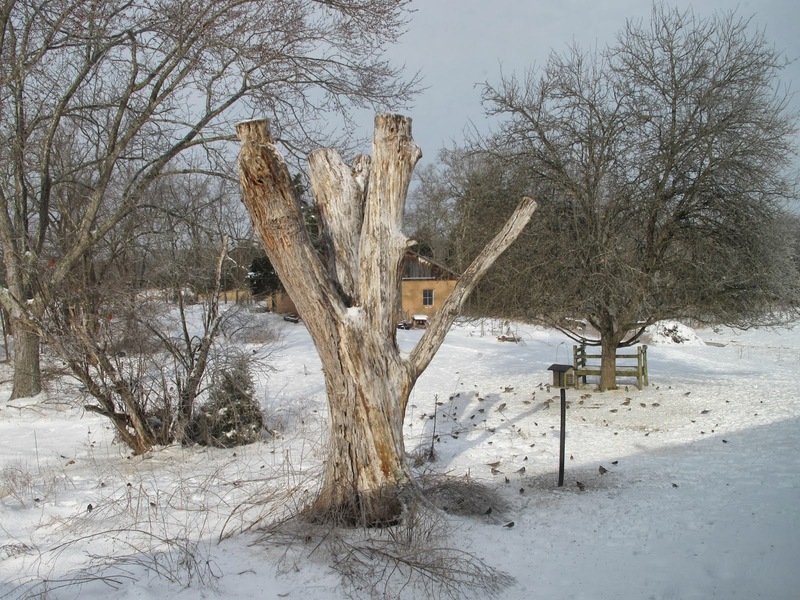 These large birds are able to break through the crusted snow and access what’s left of a bumper crop of fruits and nuts. 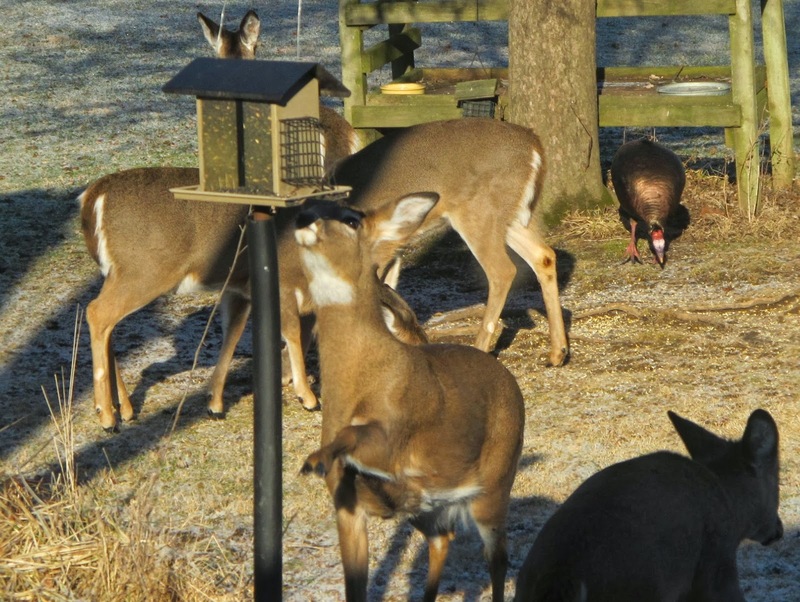 The large turkey flocks tend to visit the feeder only when the natural food supply is lacking. Maybe these two are the lazy members of the flock. They prefer foraging in the lawn exposed where snow is melted by heat radiating from sun warmed house bricks. 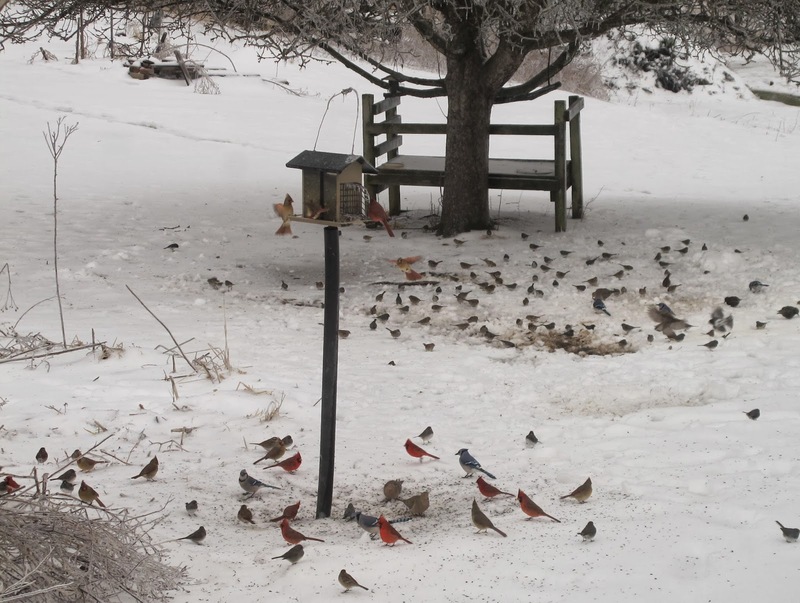 The only thing that moves birds to the feeder faster than heavy snow is an ice storm. 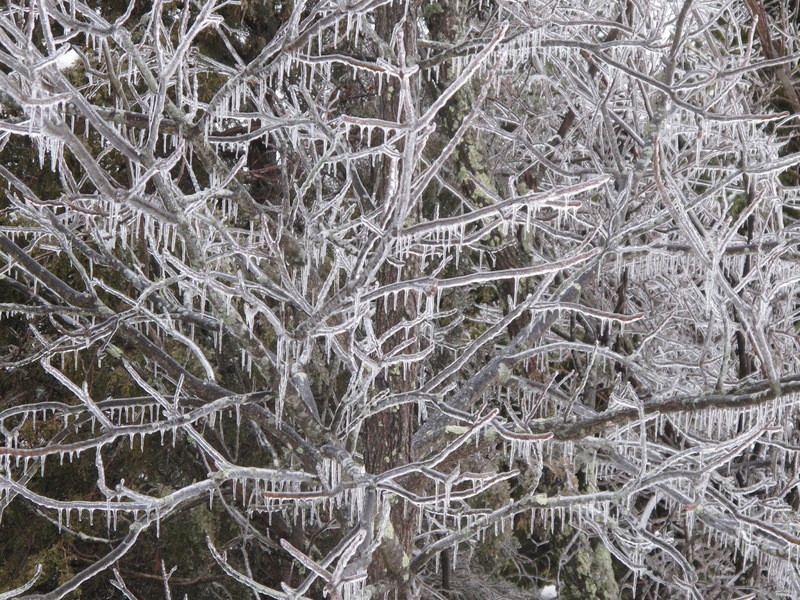 A February 5 ice storm coated trees and sealed the snow cover with a frozen barrier impenetrable to most birds. Most of the tree ice has since melted, but the iced snow pack still persists beneath six inches of more recent snow. 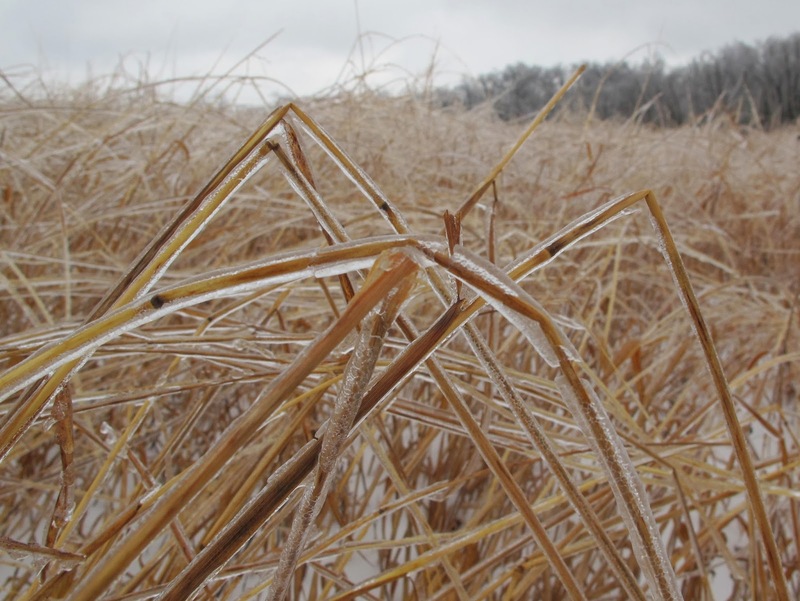 The ice also sealed away Indian Grass seeds, a source of food for flocks of wintering sparrows. 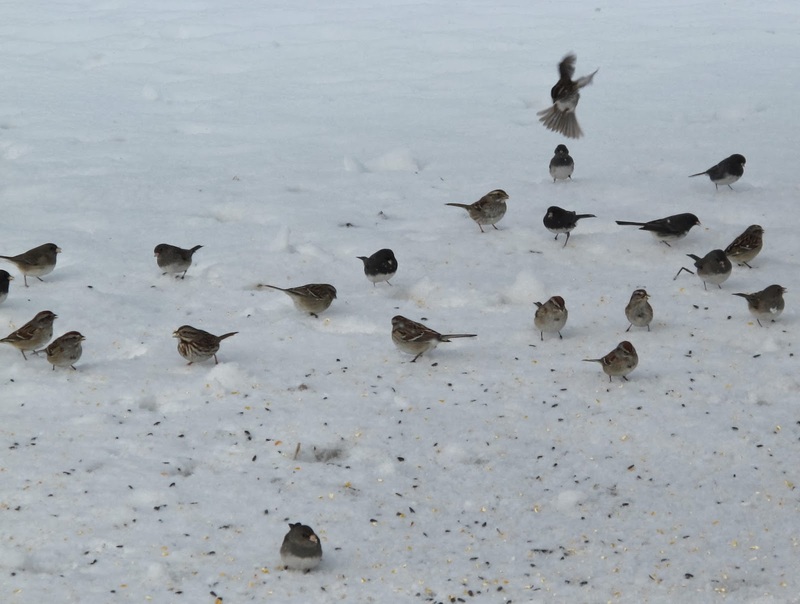 Many of these sparrows are now supplementing their diets with cracked corn. Feeding these birds is like scattering scratch for the chickens. They take to the trees when I come out, but drop down quickly when I begin to scatter the seed. 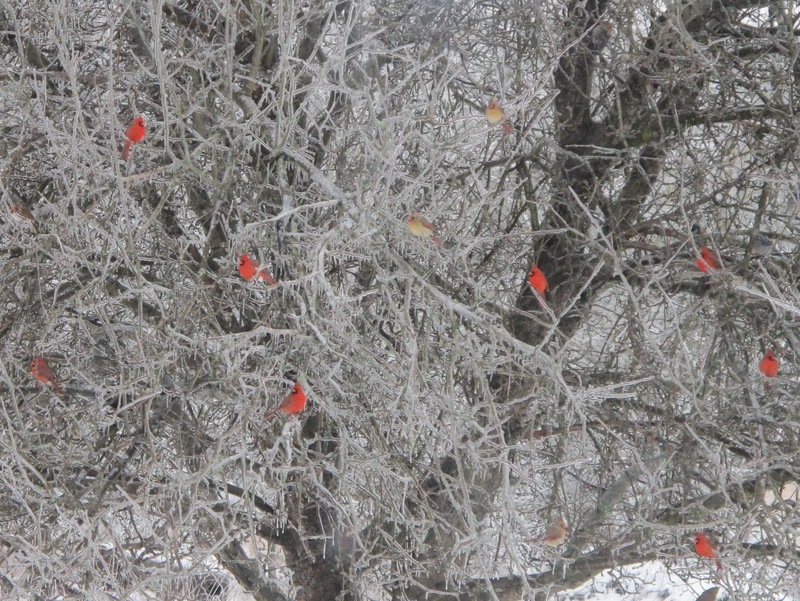 Dozens of Cardinals showed up at the feeder soon after the ice appeared. Their bright colors in the sparkling trees would have been a cheery sight if I hadn’t known what a disaster that ice foretold for so many wild animals. 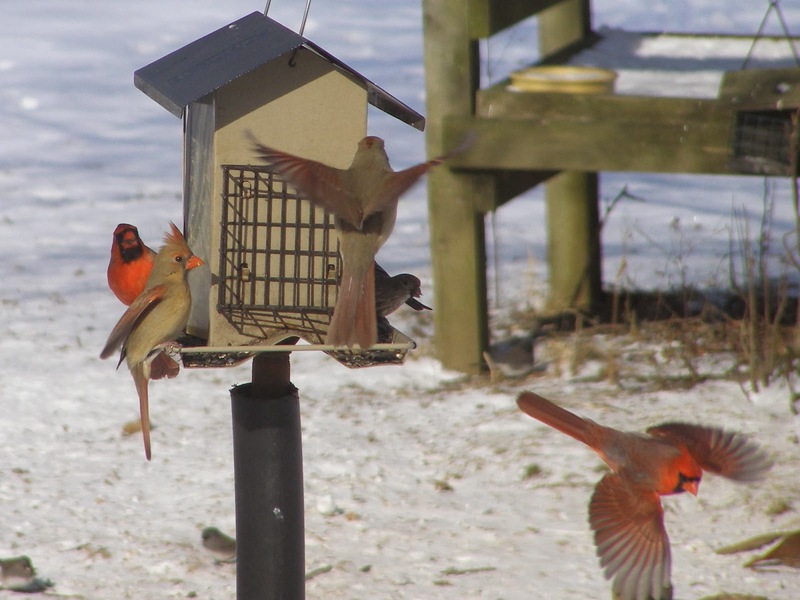 As bird numbers increased, the feeding activity took on a more frantic pace. Foraging birds ranged far from the feeding locations. 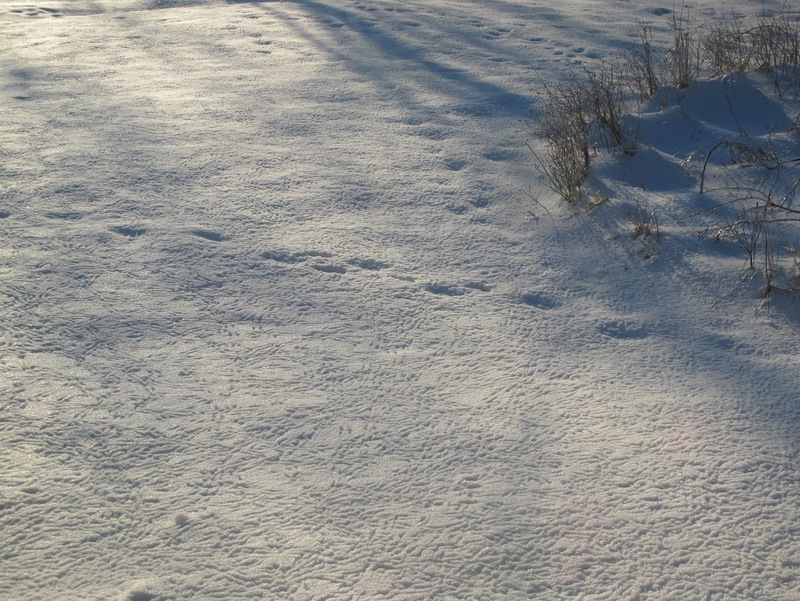 These tracks, all made within 24 hours of the last snowfall, show that the birds have searched every square inch of the snow covered lawn. 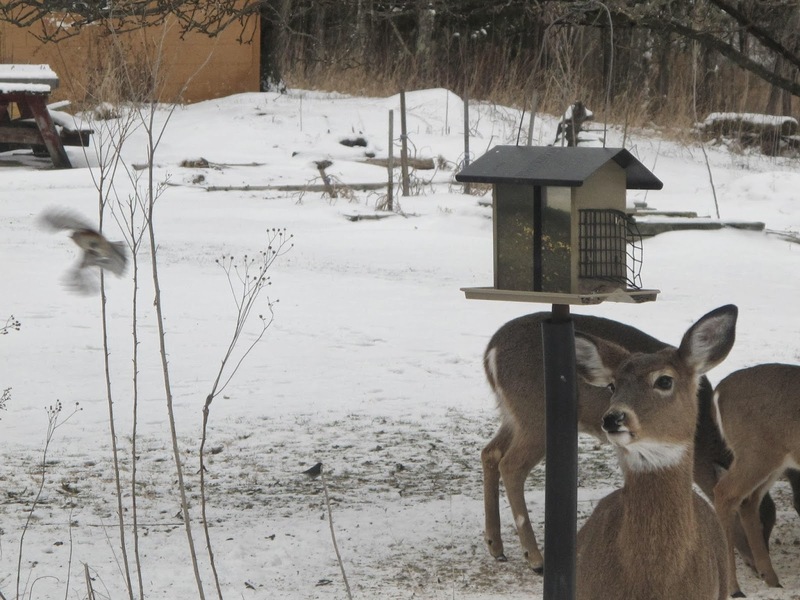 Activity at the feeder is not limited to seed eaters. 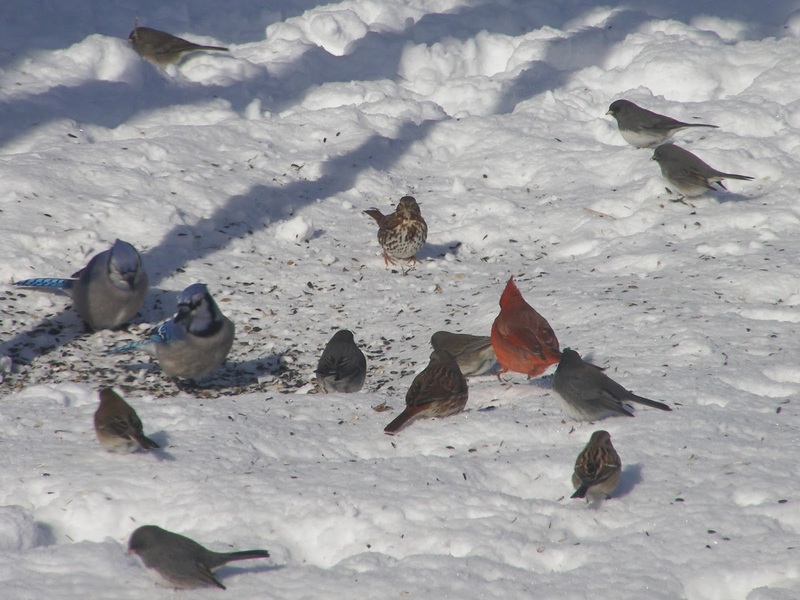 Several hawk species use the feeder area as a hunting ground. 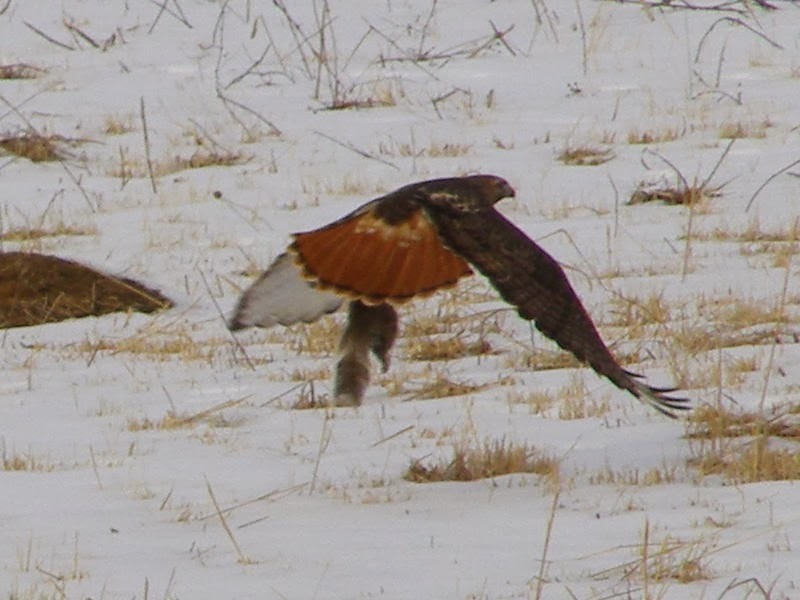 This Red-tailed Hawk is carrying off a squirrel that had been stuffing itself with sunflower seeds. Warm temperatures forecast for next week promise to melt off the snow and ice, so this temporarily concentrated activity should spread back out over a more natural area. I thoroughly enjoyed walking around Blue Jay Barrens during the spring of 2013 and viewing areas that no longer showed signs of their earlier infestation of invasive shrubs. 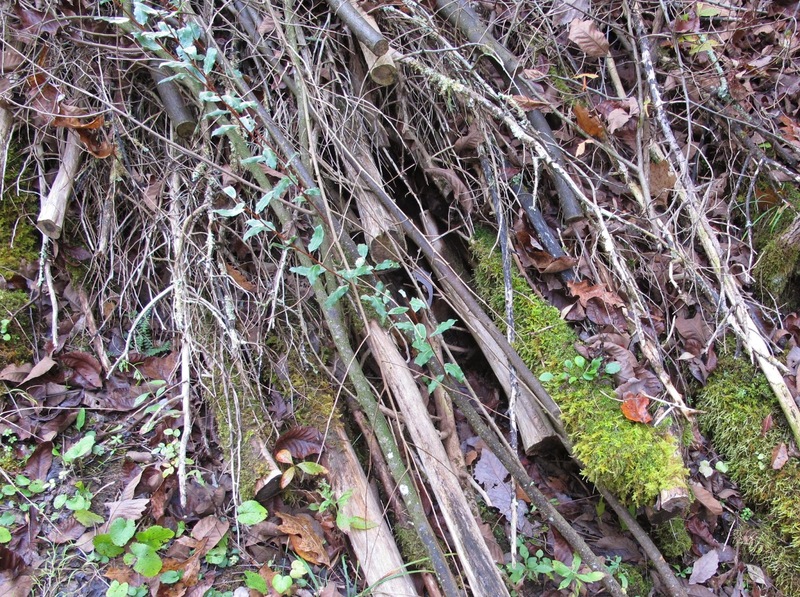 This old fence row was once choked with Autumn Olive and Multiflora Rose, two non-native plants with a nasty reputation for overrunning and destroying native habitats. 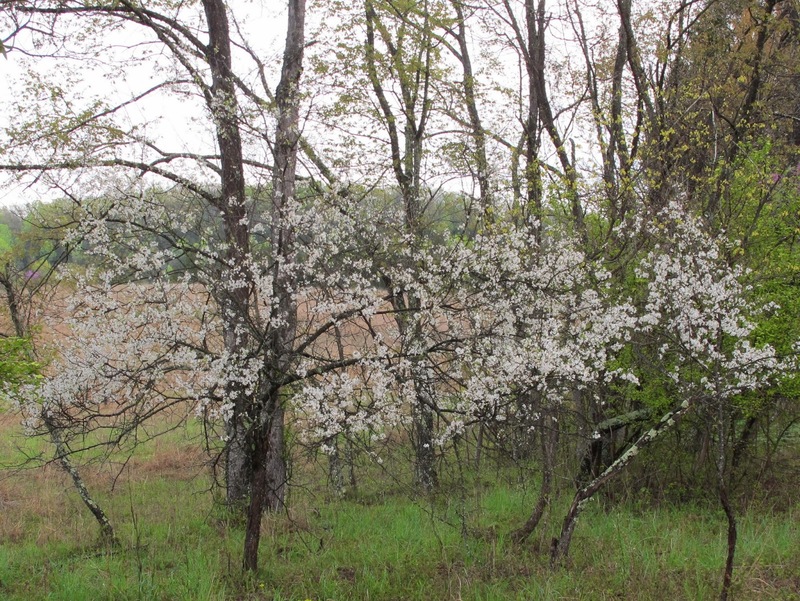 Freed from competition, the native Wild Plums displayed a profusion of blooms. After several years of battling non-native shrub infestations, it looked like 2013 would be my year to get ahead of the invaders. My system of cutting Autumn Olive and spraying the resulting sprouts with glyphosate was generating a low volume of total kills, so I changed tactics and began cutting the shrubs during the growing season and applying undiluted 41% glyphosate solution to the cut stump. With the stump treatment method I’m getting almost 100% kill. 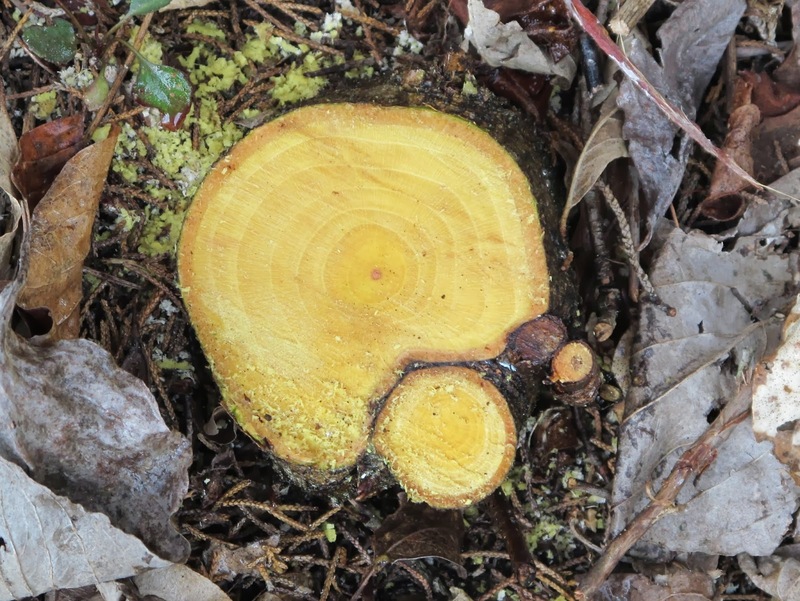 The growth rings shown on this stump illustrate how rapidly a small Autumn Olive can grow into a difficult to handle monster. In those rare instances when the stump treatment fails to kill a large Autumn Olive, this is the typical result. 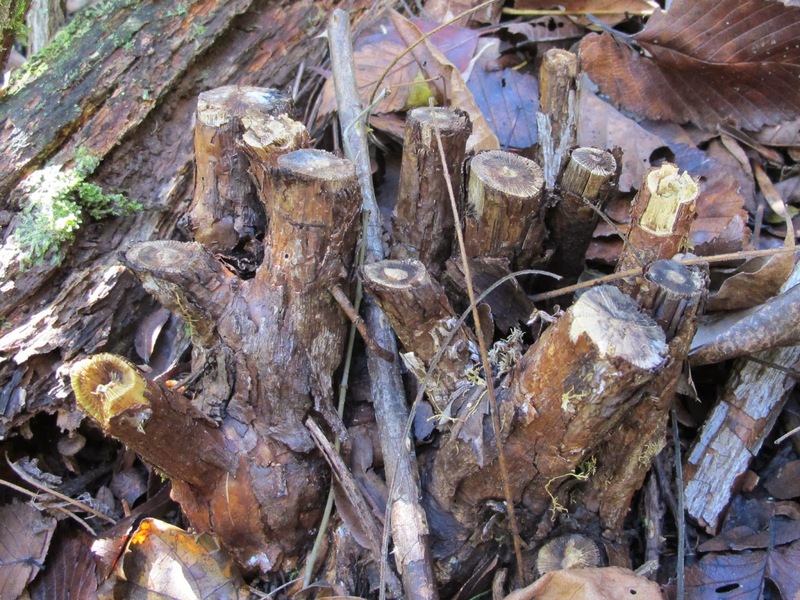 Root sprouts produce a thicket in a circle around the dead stump. This requires each sprout to be individually cut and treated. It’s aggravating work, but I’ve not had any regrowth follow this procedure. I’d like to know what conditions cause root sprouting instead of death, but I have run out of large Autumn Olive, so there are no subjects here for future research. 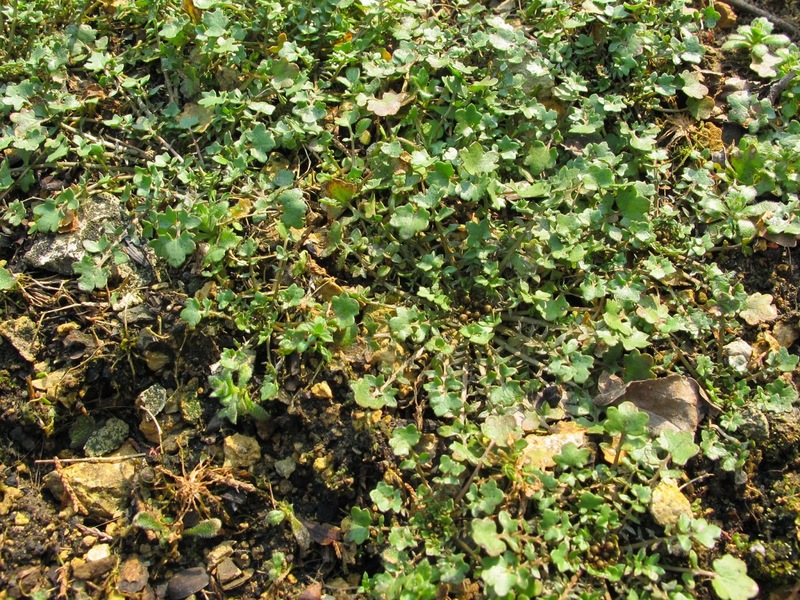 Also aggravating are the clumps of seedlings resulting from a seed laden bird dropping. 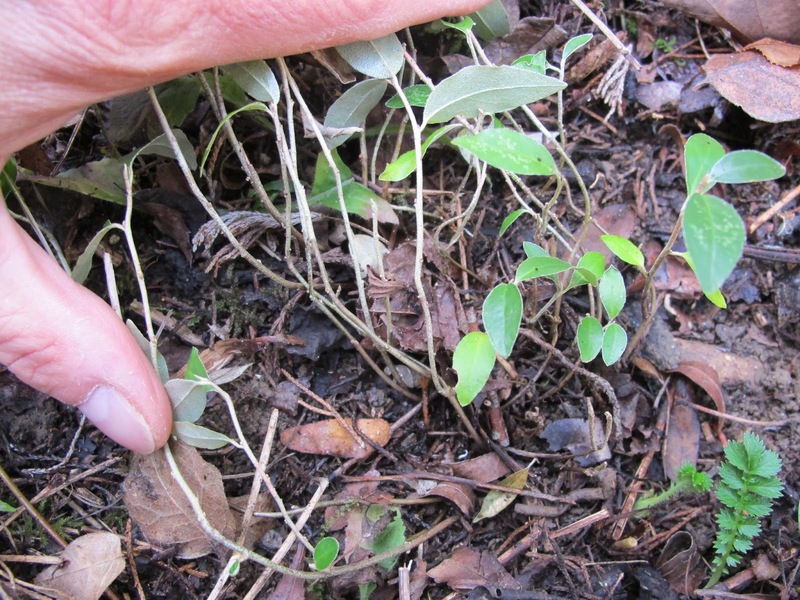 It’s sometimes possible to pull these from the soil, but the likelihood is high that the stems will break at ground level and the plant will resprout. They are also susceptible to a diluted glyphosate solution applied to the leaves. Since I don’t carry multiple herbicide solutions with me in the field, my default solution is to cut these little guys and spray their tiny stumps. The biggest problem for me is seeing the pinhead sized stumps. I was puzzled when I found this Autumn Olive growing from a brush pile on which I had placed several cut Autumn Olive branches the previous year. 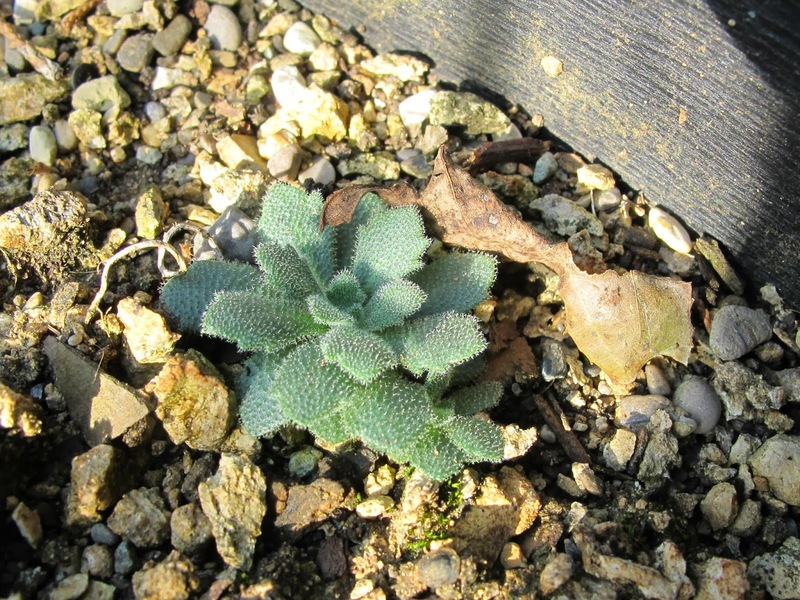 I knew that it hadn’t been there before and it was far too developed to be a seedling. I followed the branches on down to the base and found that it had already been cut. Then why was it still growing? Apparently there had been enough moisture in the soil to keep the cut branch alive and it had sprouted roots and kept on growing. I guess I’ll have to be careful about how I dispose of the cut material. 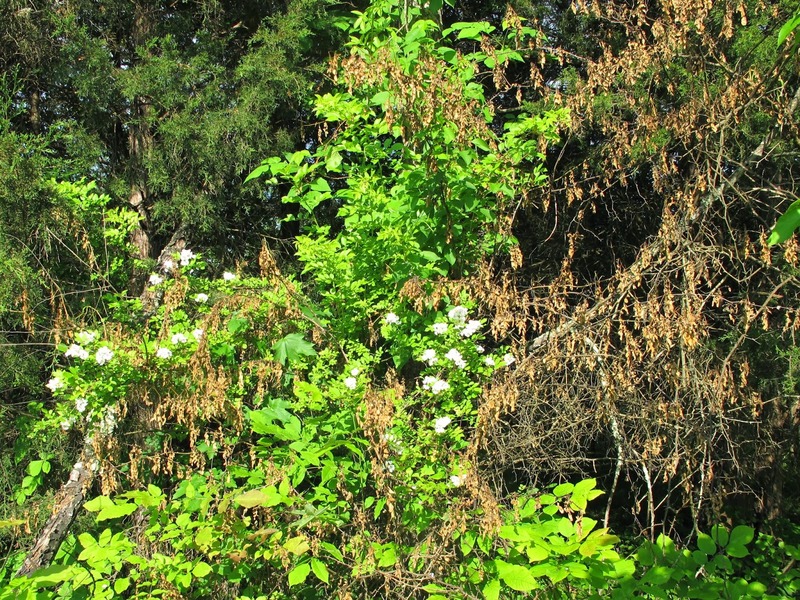 Early spring is an ideal time to locate invasive shrubs that leaf out in the first warm weather. While searching for any overlooked Autumn Olives, I kept watch for the new growth of Multiflora Rose. When found, each was cut and stump treated as described earlier. 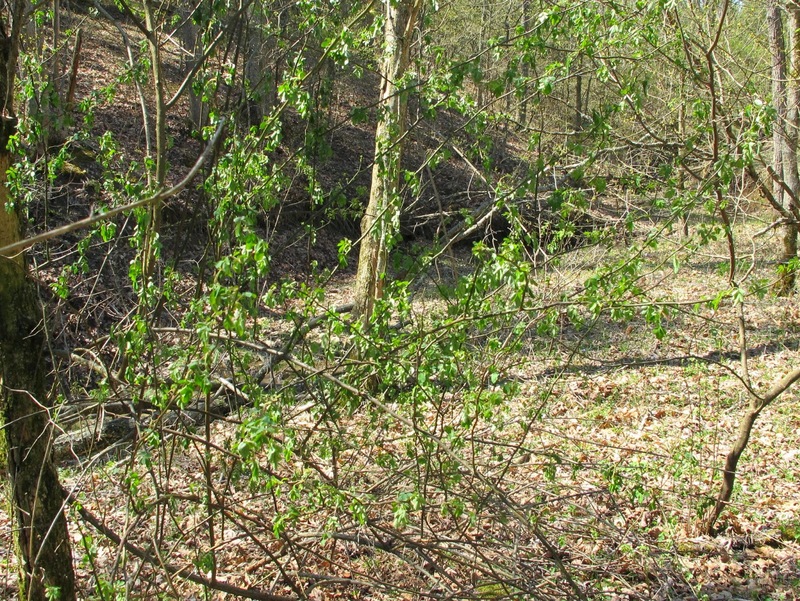 Most of the large shrubs that I found were in odd places that caused them to be over looked during my earlier searches. 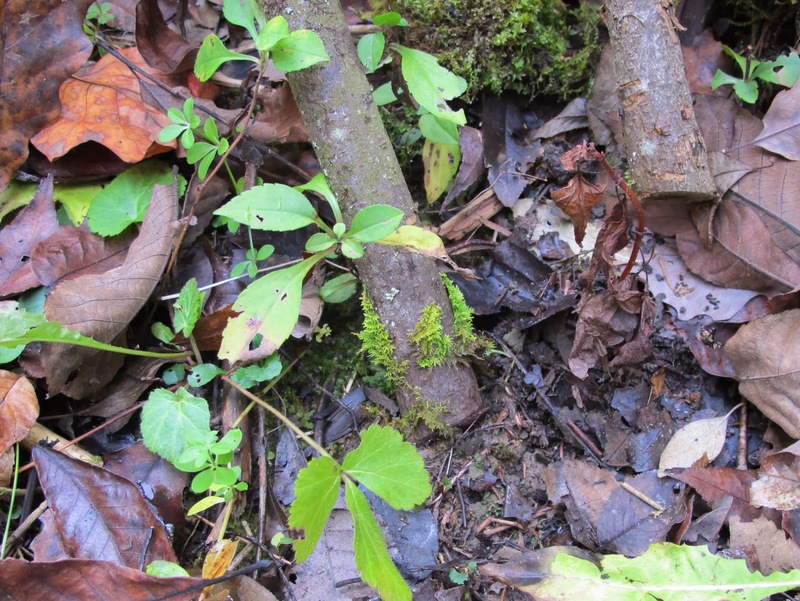 This particular specimen is one that was growing just a few feet from a frequently traveled trail. I passed it several hundred times without realizing it was a Multiflora Rose. That’s because all of the rose leaves were in the tree canopy 30 feet above my head. The large canes visible at ground level were casually dismissed as grape vines all these years. Pulling this giant from the tree was a challenge, but it is now gone. 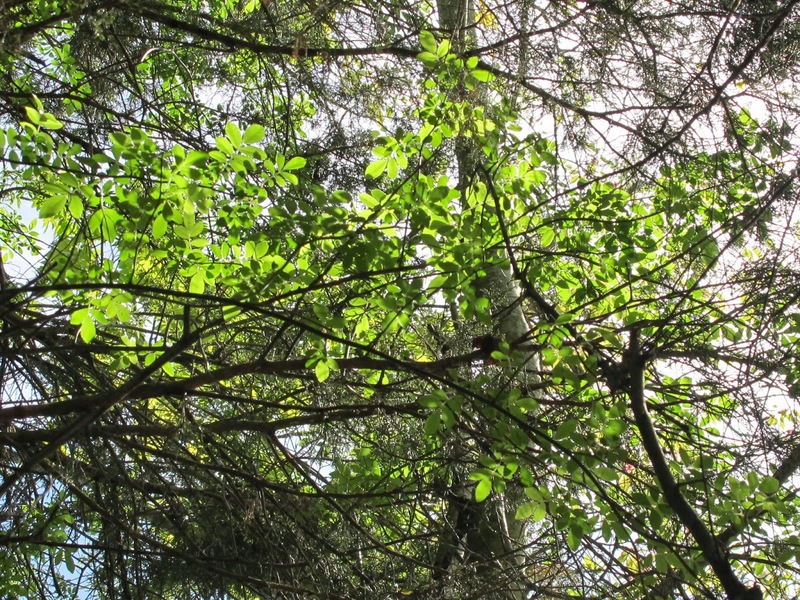 This trait of growing up through the tree branches to reach sunlight is demonstrated by both Autumn Olive and Multiflora Rose. Even when you know it’s possible, it can still be a surprise. This is what the roses look like a few days after cutting. 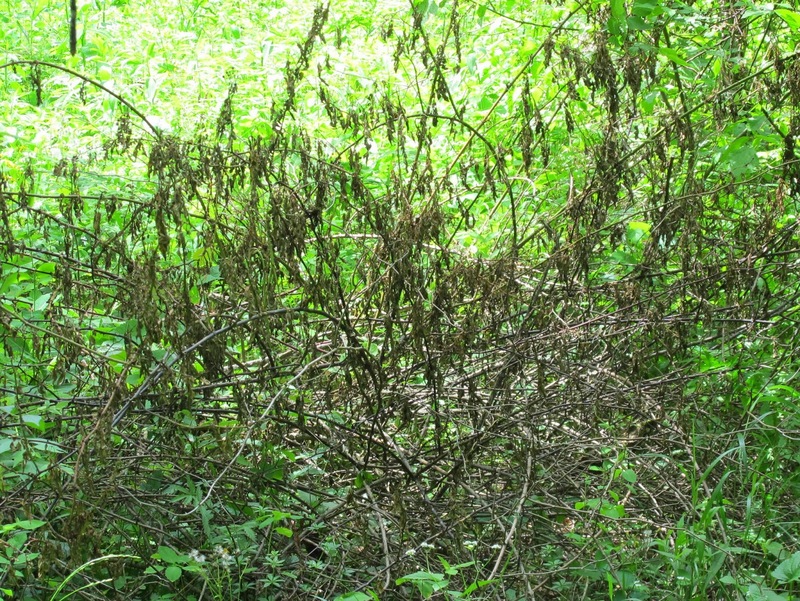 The dried leaves can take a month or more to drop and the canes will remain upright for over a year. This rose stump was treated in October of 2012 and seven months later shows no signs of life. 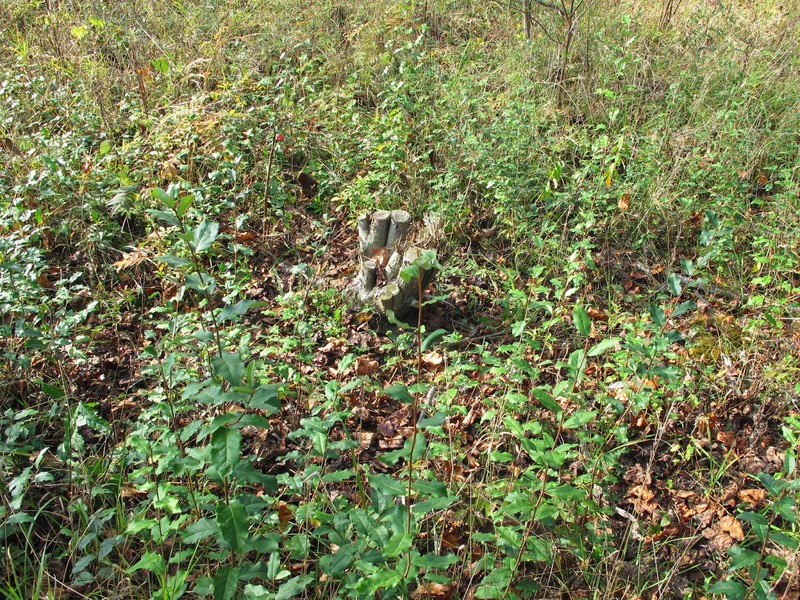 I have yet to find any regrowth from treated Multiflora Rose stumps. 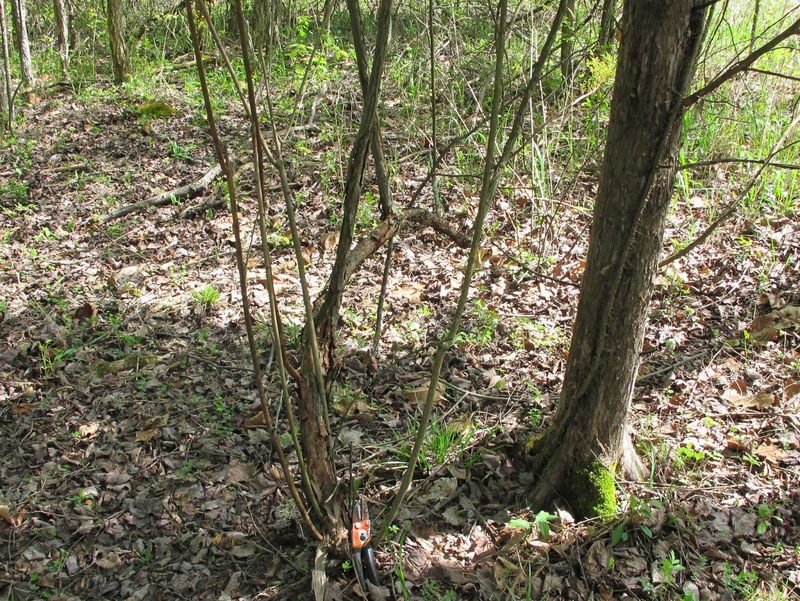 I visited the last areas of Multiflora Rose infestation on a weekly basis through the early summer to catch any live plants that I had missed. This patch was most troublesome. Dead leaves clearly show canes that were cut and treated. 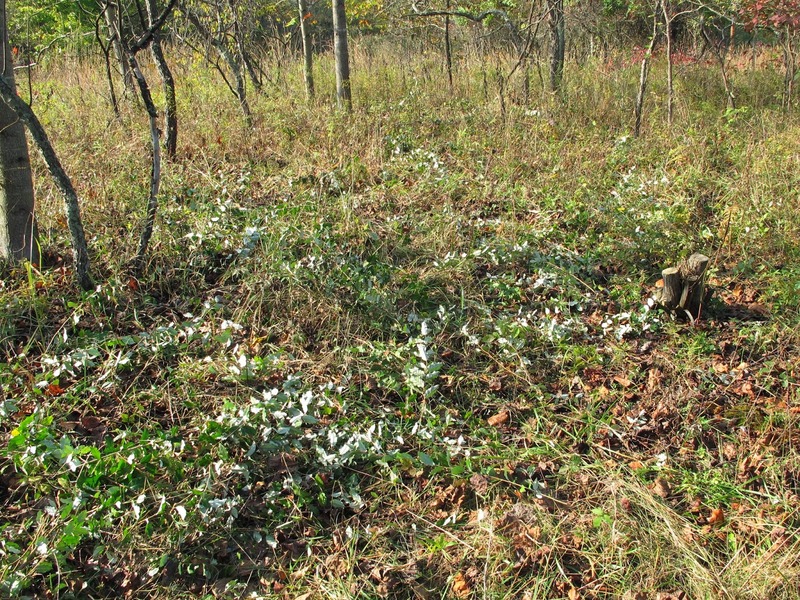 Two canes covered in white flowers are from still living rose plants in the thicket. I was a bit scratched up, but when I finally crawled out of that mess, every live cane had been cut and treated. 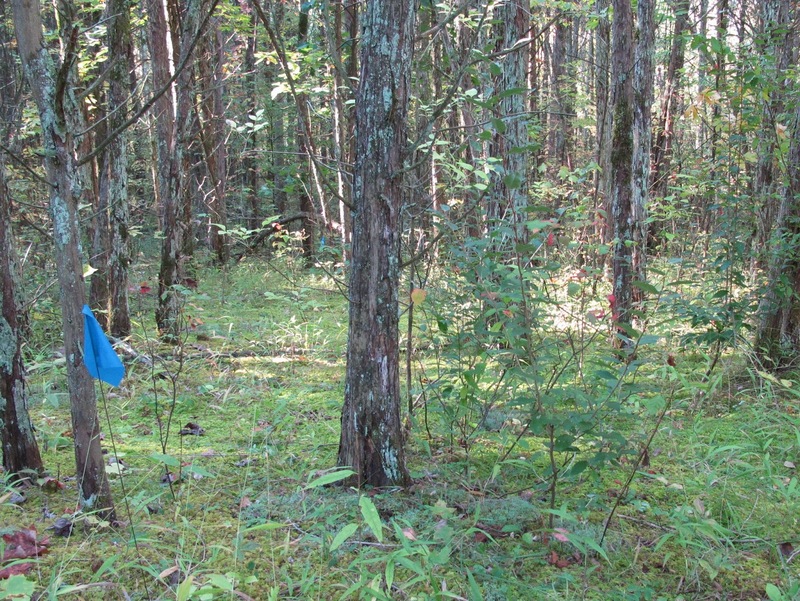 During September and October 2013 I conducted a search of areas with a history of invasive shrub infestations in order to find and eliminate all remaining individuals of those noxious species. I had been through all of these areas during the past few years to cut the larger fruit producing specimens. My goal now was to come as close as possible to completely eradicating the invasive shrubs from the property. 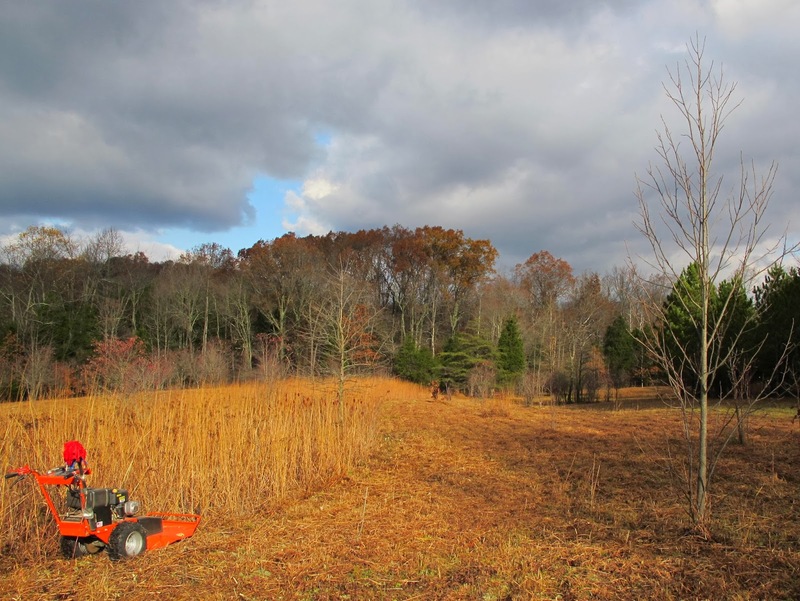 Using alternating lines of blue and red flags to delineate a work area, working one narrow strip at a time, I cut and treated invasive shrubs on 65 acres. My final 2013 assault on invasive shrubs came in November. Eight acres of prairie fields were due for mowing according to my rotating schedule. 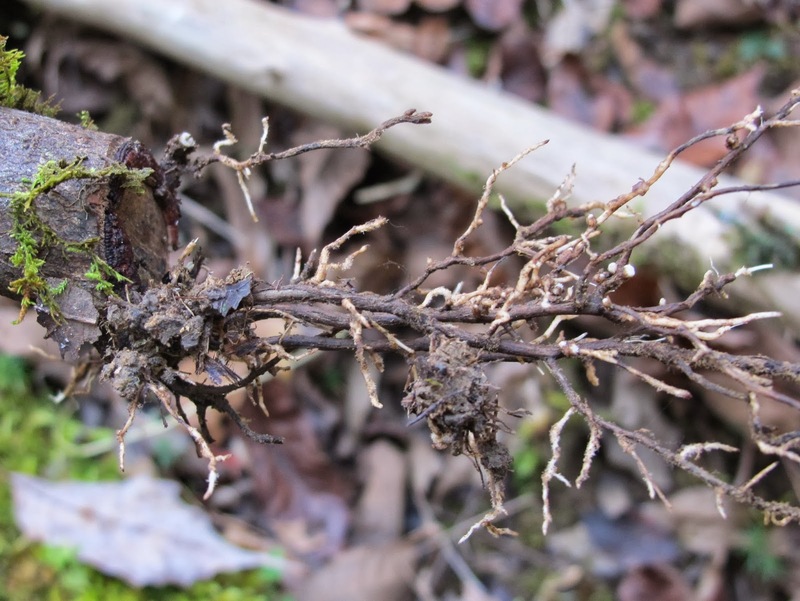 This activity is normally done in December, but I chose to begin on November 1 while the Autumn Olive and Multiflora Rose were still at a stage of growth that was susceptible to herbicide treatment. I finished the year feeling that the control of Autumn Olive, Multiflora Rose, Bush Honeysuckle and Japanese Barberry at Blue Jay Barrens was now a maintenance issue. I know that birds will still carry seeds onto the property and I’ll have to deal with the new shrubs that sprout, but at least for a few invasive species, I feel I am now in control. 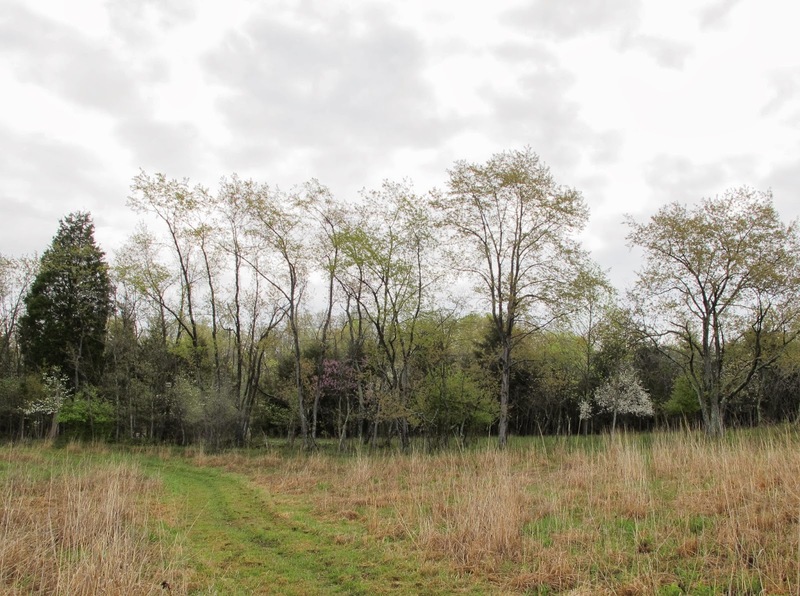 Located in the Bluegrass region of Southern Ohio, Blue Jay Barrens contains excellent xeric habitat inhabited by a wide variety of rare native plant and animal species. Since 1985, this private property has been managed to improve the integrity of the special ecosystems found here. This blog provides information on the current activities at Blue Jay Barrens. It’s my intent to share information on current events at Blue Jay Barrens. Unless otherwise noted in the text, all photos were taken by me at Blue Jay Barrens. Plant scientific names are from Gleason and Cronquist 1991. I realize that some changes in preferred nomenclature have occurred, but this is the principle reference I have been using for flora identification. Knowing this, I believe most people can figure out just what plant I’m talking about. My discussions of flora and fauna are not intended to be a complete life history. There are plenty of good references for this type of information. I am discussing my personal experiences with plants and animals on this specific property. Any other information I may provide is intended to help you understand the significance of my observations. I own and manage Blue Jay Barrens. Where have all the bats gone? Forests as communities, not commodities. 1- Of Mosquitoes, Moths and Mice, by C Brooke Worth. 2- Mosquito Safari: A Naturalist in Southern Africa, by C Brooke Worth. 3- A Naturalist in Trinidad, by C Brooke Worth.